There may be some bad feelings wafting across the Jordan River. But, even in a now more tense Middle East, the relationship between the Hashemite kingdom of Jordan and the State of Israel is pretty well-tempered. There is constant contact between their intelligence services; there is cooperative work being done to rescue the Dead Sea from being no sea at all; the two countries coordinate research on the 500 million birds which migrate between them in the Jordan rift valley, the crossing from Asia and Europe to Africa ... and back; there is tourism between the monarchy and the democracy, more from the latter, but still. It is also true that since the Arab Spring, King Abdullah has been under some popular stress (mostly from Palestinians under his rule, 60 percent of the population, after all). The old folk song telling us that “the river is deep and the river is wide” is not quite accurate. Several weeks ago, Israel officially reopened the Qasr Al-Yahoud baptism site on the west bank of the Jordan, near Jericho, which has been largely kept closed since 1967. The site is traditionally believed to be the location of Christ’s baptism, and is one of the most important destinations for Christian pilgrims. 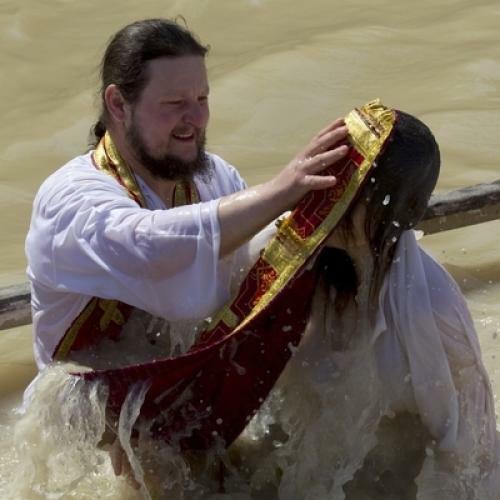 The opening of the Israeli site angered Jordan, which operates a baptismal site on the east bank of the river, in Al-Maghtas (also known as Bethany-beyond-the-Jordan). The Jordanian government protested that the Jordanian site is the authentic one, and that it had been recognized as such by the Vatican and by Pope John Paul II, who attended its inauguration in 2000. Jordan accused Israel of falsifying history and the Christian faith and of trying to undermine Christian tourism to Jordan. It even filed a complaint to this effect with the Vatican. It should be noted that the Jordanian and the Israeli sites directly face each other across the Jordan River, which is only a few meters wide at that point (see photos below). The conflict is therefore mainly over the Christian tourism to the area, with Jordan’s concern being that the opening of the Israeli site will mean fewer visitors to the Jordanian site. It is still just a piece of history in the life of “the prince of peace.” So maybe the conflict will just simmer and die. But if you want all the details, here they are. Thank God there are no Muslims in this religious quarrel. They have enough on their plate.